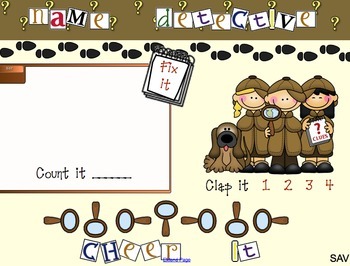 This SMARTboard file includes 4 fun games, and poems to play and incorporate into your day! Poems and games are built around: Willoughby Wallaby Woo, Bippity Boppity Bumblebee, Cheerleader Names, and Name Detectives. Each page works on phoemic awareness skills, alphabet identification, sound identification, or syllabicaton skills. The pages are fun, interactive, creative and CUTE! Your kids will love playing these games that center around the thing most important to them...their names! !